Algoriddim, makers of djay, the most popular DJ app for iOS in over 70 countries and winner of a 2011 Apple Design Award, unveiled the highly-anticipated update to that app on Thursday, djay 2. Should you upgrade if you have the first version for $10 (or $5 if you buy during the introductory pricing period) — or dive in for the first time if you don’t, for the same price? Let’s take a look. DJing is one of the most disrupted areas of life today, with most practitioners having long ago switched from vinyl to laptop, and maybe an outboard hardware controller. Now, iOS apps are making even laptop kits look bulky. 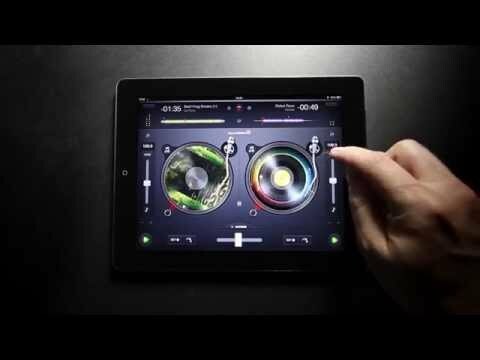 With djay 2, an already-powerful app adds significantly to its unparalleled feature line-up, taking advantage of today’s faster iOS devices with a new interface and library, a sampler for adding one-shots to your sets (with some samples included), high-definition waveform views that leverage Apple’s Retina display, new effects, support for more outboard gear, and more. As with almost all DJ software, you can just activate Autoplay and walk away as the app takes care of everything, but the fun starts when you get more involved. For starters, the HD waveform view “allows users to touch and interact with their music at an unprecedented level of detail and clarity,” according to Algoriddim, which we can confirm is the case, even as the app runs just as smoothly as before. While in the HD waveform view, you can go even further by tapping the icon that looks like a table you’d make in Microsoft Word. This allows you to live-sample from four sections of the waveform, as it plays. This feature, referred to as “Slice Mode” offers excellent possibilities for on-the-fly remixing. Moving downward, you’ll encounter an icon for the built-in sampler, which doubles as a drum machine. The sampler comes with transitional sounds such as horns or sirens, for example, and a dubstep pack with industrial-sounding hi-hats and wobbles for jazzing up whatever you’re spinning. The sampler can also grab snippets from your music library, so really, the sky’s the limit on that front. Meanwhile, an all-new file browser for queuing up songs should help embattled DJs who field requests from the dance-floor and like to reorder their own sequences on the fly, for whom being able to queue songs fast without interrupting the mix is key. Most DJ apps help you sync two songs together; if you’re trying for a more manual approach, Algoriddim goes beyond the standard with new audio analysis that makes it plain, even the small “Spectral Timeline” at the top of the app, where the choruses, verses, and drops fall. Another neat perk: virtual grooves on the records that let DJs identify breaks based on peaks and valleys, the way they used to with vinyl. More useful features include the ability to analyze your entire music library before you even import the songs into the app, which makes them load significantly faster; sharing of customized beat grids through iCloud to your iPad, iPhone, and Mac; sorting by BPM; and MIDI improvements. In other words, we recommend this app if you’re a “real” DJ, as opposed to a newbie, who’s probably better off with one of these free options. For the iPad, it costs $5 this week, after which the price will double. Meanwhile, the iPhone version is a bargain at $1.